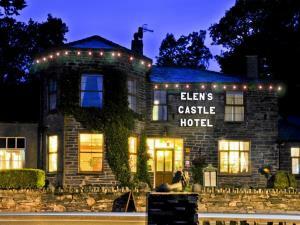 Elen's Castle Hotel HotelFantastic 18th century coaching inn set in the heart of the Snowdonia National Park. Whilst retaining its historical charm and many original features, it is now a fully modernised hotel in a peaceful, village setting away from the crush of tourists. An award-winning restaurant, a cosy bar with a log-burning stove, a large car park, free Wi-Fi, USB charging points in most of the rooms, a warm welcome and excellent service await you at this highly recommended hotel. Elen's Castle Hotel from the front - what you see when you arrive! 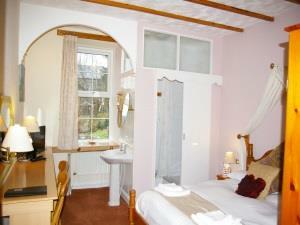 Elen's Castle Hotel sometimes limits bookings to 3 or more days. See our own website for seasonal offers. 4-poster double sometimes limits bookings to 3 or more days. Budget Room sometimes limits bookings to 3 or more days. Family/Group sometimes limits bookings to 3 or more days. I wanted somewhere to stay with my son near Snowdonia. I chose this hotel by chance from the Internet, as a result of reading the hotels good reviews. We weren't disappointed... The owner and his wife were very friendly and welcoming. We ate in the hotel in the evening and the food was all local produce and very good value for money. I would definitely recommend the hotel.